The U.S. was set to activate a new wave of steep tariffs on imports from China on Jan. 1, 2019. Those tariffs would have provoked more retaliation from China, although China’s scope was limited because they were running out of U.S. imports to apply tariffs to since China buys far less from the U.S. than the U.S. buys from China. In early December, President Trump and Chinese President Xi reached a 90-day “truce” whereby they agreed to hold off on new tariffs until March 1, 2019, to give time for both sides to negotiate the most contentious issues and arrive at a mutually satisfactory agreement that would end the trade war. Not much happened in December, although China indicated it would roll back some of its 2018 tariffs and buy more soybeans from the U.S. This did not represent real progress since it only restored the status quo and did nothing to solve the more contentious issues of theft of intellectual property and limitations on direct foreign investment. Since Jan. 1, the White House has issued a series of upbeat statements suggesting the trade talks were going well and a positive outcome might be within reach. The Chinese echoed these views. Markets responded positively to the prospect of the trade wars winding down. Not so fast. 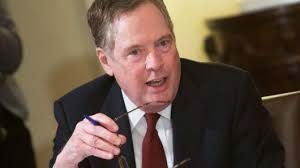 According to this article, the U.S. Trade Representative Robert Lighthizer told Congress that very little progress has been made on the tough issues of intellectual property and investment restrictions. China is unlikely to concede much on these issues because it relies on stolen technology to make its own industries globally competitive. Trump is unlikely to conclude an agreement that does not offer protections in these areas that are substantive and verifiable. It’s possible that the 90-day truce will be extended if some progress is made in the next six weeks. But it’s also possible that the U.S. will end the truce and raise tariffs as originally planned in order to force China’s hand. Markets are not ready for a blow-up in these trade talks. Investors should be.